Hello there everyone! 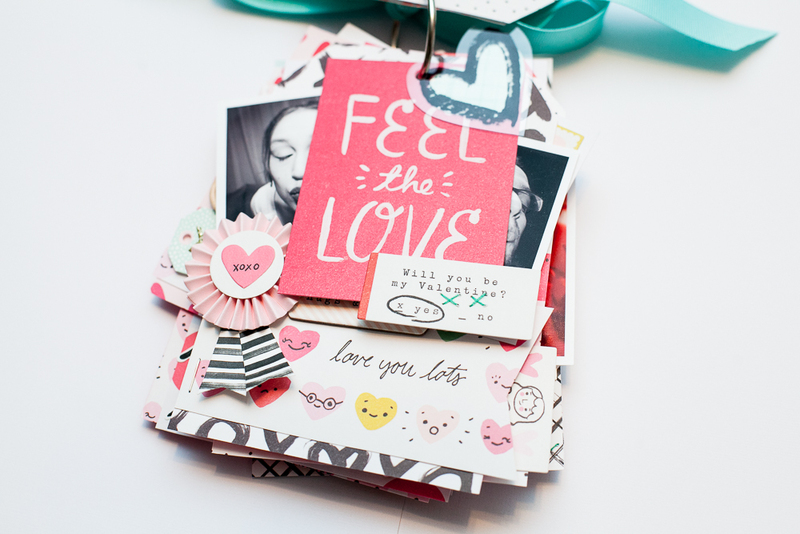 I have been meaning to post this fun Valentines Mini Album that I did for the Crate Paper Heart Day collection and the Crate Paper booth at Creativation/CHA. I loved making this album. I think I always have a lot of fun making goodies for Valentines Day. It is a fun holiday to create for. I love all the pinks and reds and all the pretty hearts and love themed things! I think I also just love memory keeping about my hubby and telling our love story! Anyhow, here is the album I made! I decided to do a tag mini album. I enjoy tag minis because they are simple and fun and combine two of my fave things – tags and minis! For my cover, I used some of the pretty gold foil heart vellum and one of those cool fringed hearts that come in the collection. And to make it have some extra pop and interest, I used one of the transparency pieces that comes in the ephemera pack to place on top of it. This works as a kind of title to my album – which is simply “Happy Valentines”! This Valentines Mini is essentially that – a series of valentines bound together. I used a ton of the awesome Valentine cards that come in the Heart Day collection and wrote little love notes to my hubby on the back of all of them. The mini consists of these and tag shaped pages using Valentine photos and patterned paper and pretty embellishments from the collection. I have several fave pages in this album. I really love this tag page that has the two photos of Ryan and I, each making kissy faces! They are silly but sweet photographs! And I think it was appropriate to use the “xoxo” patterned paper for the background of this page and the little ribbon embellishment that says “xoxo” on it, as well as the “hugs and kisses” chipboard sticker and the “love you lots” piece with the super adorable heart face emojis! I loved using little fun bits here and there in between the tag pages in this album, like the little envelope to “my sweetheart” with the little airmail heart postage stamp on it and the arrow sticker. One of my favorite embellishments to use from this collection was the conversation hearts. I love the cute little boxes of conversation hearts that you get to eat for Valentines Day with sayings on each candy like “be mine” and “luv you”. These little embellishment heart versions of the candy ones are so cute and just add a special touch to the album. I decided to have different sizes of pages in the album to just make it really interactive. I think that this shorter page with the use of the cool “x” and “o” paperclips is simple but fabulous. I absolutely love those paperclips! Paperclips are one of my favorite things to use in scrapping so of course I fell in love with these ones! Another awesome embellishment that I loved using in this album were the super cute heart emoji puffy stickers. Those little faces are just the best thing and they make me smile! I used a mix of both black and white and colored photos for this album and I stuck to a theme of photos that I really felt showed my hubby and I and our relationship which is just filled with love and silliness! For finishing touches on the album, I did some hand stitching here and there on several of the pages. I love the look of zig-zag stitches and cross stitches in the album. I think it brings a sweet touch to it that makes it feel carefully pieced together with love...which is exactly how it was made. I hope you like my Happy Valentines mini album that I made using Heart Day and that I have given you a few fun ideas and inspiration to make a similar mini yourself. Tag albums are always fun to make and I especially enjoyed making this one to give to my prince charming of a hubby. I think this is a fun Valentine present to give to your loved one/s but it works whether you make it before or after V-day ...especially since you may want to make a mini like this after you have your February photos all taken. A love themed album like this though for someone special in your life is always a good idea at any time of year, holiday or no. So that's it! Hope you had a happy Valentines Day and a great February and that you are having lots of happy scrappy fun and living your life as a fairytale! P.S. Here is a cute little card I made for Valentines Day for the creativation booth for Crate Paper too, also using the Heart Day collection. Hope you like it!